Cellist Han-Na Chang has already established an impressive international career, performing regularly on the most prestigious concert stages of Europe, North America and Asia. 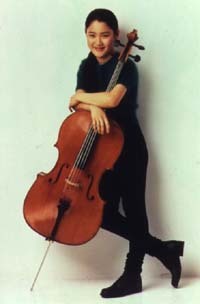 She first won recognition for her exceptional musical gifts at the Fifth Rostropovich International Cello Competition in Paris, at the age of eleven, taking the First Prize as well as the Contemporary Music Prize, unanimously chosen for both awards by Maestro Rostropovich and ten other jury members. Since that time, she has confirmed her standing as one of today's most outstanding young instrumentalists with her mastery of a growing repertoire and the breadth of her performing activity. In recent seasons, Miss Chang has made successful debuts with many of the world's great orchestras, including the Bayerischer Rundfunk Orchestra, the Berlin Philharmonic, the Boston Symphony, the Cleveland Orchestra, the Cincinnati Symphony, the Dresden Staatskapelle, the Israel Philharmonic, the London Symphony Orchestra, the Maggio Musicale Orchestra in Florence, the Minnesota Orchestra, the Montreal Symphony, the National Symphony Orchestra in Washington, DC, the New York Philharmonic, the NHK Symphony in Tokyo, the Orchestre de Paris, the Philadelphia Orchestra, the Pittsburgh Symphony, the Santa Cecilia Orchestra of Rome, the La Scala Orchestra of Milan and the San Francisco Symphony. Among the conductors with whom she has had notable collaborations are Herbert Blomstedt, Myung-Whun Chung, James DePreist, Charles Dutoit, Mariss Jansons, Jesus Lopez-Cobos, Lorin Maazel, Zubin Mehta, Ricardo Muti, Seiji Ozawa, Mstislav Rostropovich, Giuseppe Sinopoli and Leonard Slatkin and Yuri Temirkanov. Her recent concerts with Maestro Maazel during the 1999-2000 season have included programs with the Bayerischer Rundfunk Orchestra in Munich, Stuttgart and Baden-Baden, and at the Bad Kissingen Festival, and with the Orchestre de Paris in Paris and at Versailles-encompassing such repertoire as Beethoven's Triple Concerto, Schumann's Cello Concerto and Maazel's Music for Cello and Orchestra. During the summer of 2000, Miss Chang makes her Hollywood Bowl debut with the Los Angeles Philharmonic led by Leonard Slatkin and tours Australia for the first time, giving concerts with the Sydney Symphony led by Maestro Slatkin as part of the cultural celebrations during the Olympic Games. Her 2000-01 season is highlighted by a tour of Japan with the Bayerischer Rundfunk Orchestra under Lorin Maazel (part of a worldwide celebration of Maestro Maazel's 70th birthday); additional appearances in Japan with Charles Dutoit and the NHK Symphony; a major European tour with the Cincinnati Symphony under Jesus Lopez-Cobos, with whom she also appears in Cincinnati and at Carnegie Hall, performing the Shostakovich Cello Concerto No. 1; concerts in Hungary with the Orchestre National de Lyon led by David Robertson; return engagements with the Minnesota Orchestra and the Hong Kong Philharmonic; and her debut with the Atlanta Symphony Orchestra under Jeffrey Tate. In November 1995, she made her first recording for EMI Classics with Mstislav Rostropovich and the London Symphony Orchestra, featuring Tchaikovsky's "Rococo" Variations, Saint-Sa?s' Cello Concerto No. 1, Faure's "Elegie" and Bruch's "Kol Nidrei." Her second recording, released in 1998, is of the two Haydn Cello Concertos with Giuseppe Sinopoli conducting the Dresden Staatskapelle. Both releases have become best sellers worldwide. Her newest recording, an album of shorter works for cello and orchestra with Leonard Slatkin and the Philharmonia Orchestra in London, is due for release during the 2000-01 season. Han-Na Chang made her formal debut in March 1995 in her native Seoul with Giuseppe Sinopoli conducting the Dresden Staatskapelle and her Carnegie Hall debut with Charles Dutoit and the Montreal Symphony in October 1996. She has given extensive recital tours of Korea and Japan, and further recitals are planned in Europe and North America. She has also had the opportunity to play chamber music with such artists as Mischa Maisky, Gidon Kremer and Dmitry Sitkovetsky at the Verbier and Lockenhaus (Kremerata Musica) Festivals. Miss Chang has appeared in several televised concert broadcasts, including the 1998 Easter Day concert from Munich with Lorin Maazel and the Bayerischer Rundfunk Orchestra and the Kennedy Center's 25th anniversary gala. She also was featured at the 1997 "Victoire de la Musique" awards, televised throughout Europe, and has been profiled by "CBS Sunday Morning" and CNN, among other networks worldwide. In 1997 she was honored with the Young Artist of the Year prize at the ECHO Classical Music Awards in Germany. Han-Na Chang began her musical studies at age 3 on the piano and switched to the cello three years later. She participated on a full scholarship in the master classes of Mischa Maisky in Siena, Italy, and has studied privately with both Maestro Maisky and Maestro Rostropovich. In September 2000, she begins her senior year at the Rockland Country Day School in Congers, New York. and by the Internet Cello Society.